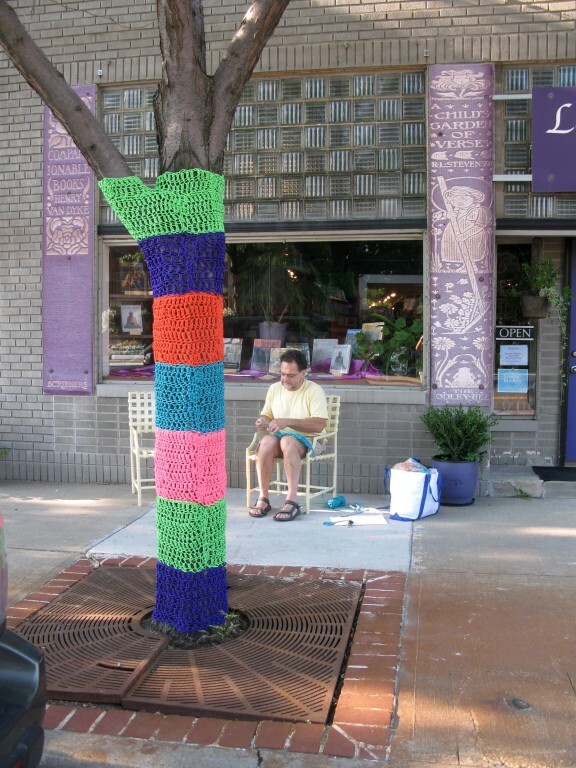 Knitscape Larchmere is the second of my Knitscape projects. 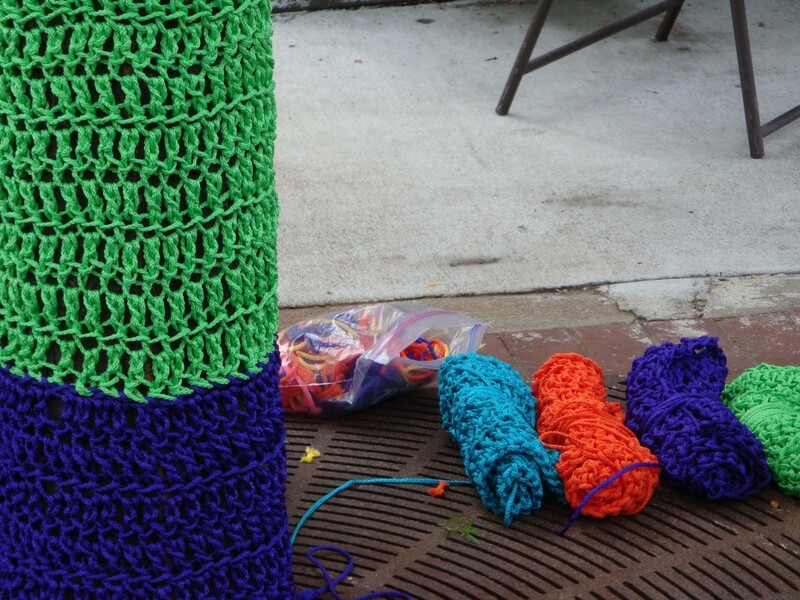 The purpose of the Knitscape public art projects was to demonstrate how art can visually unify the streetscape, to create a community around an art project and to enliven daily life with unexpected art and After working on the Knitscape projects, I can say with no reservations that we met and far exceeded these goals. 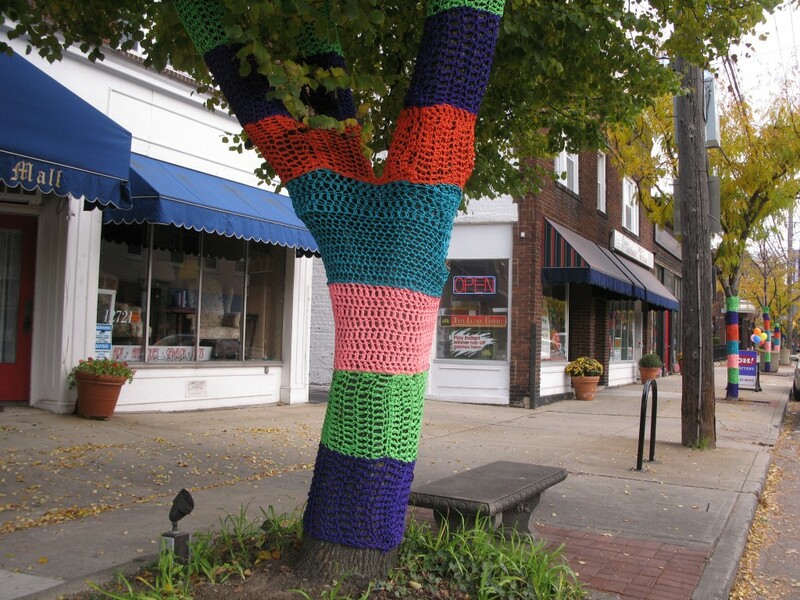 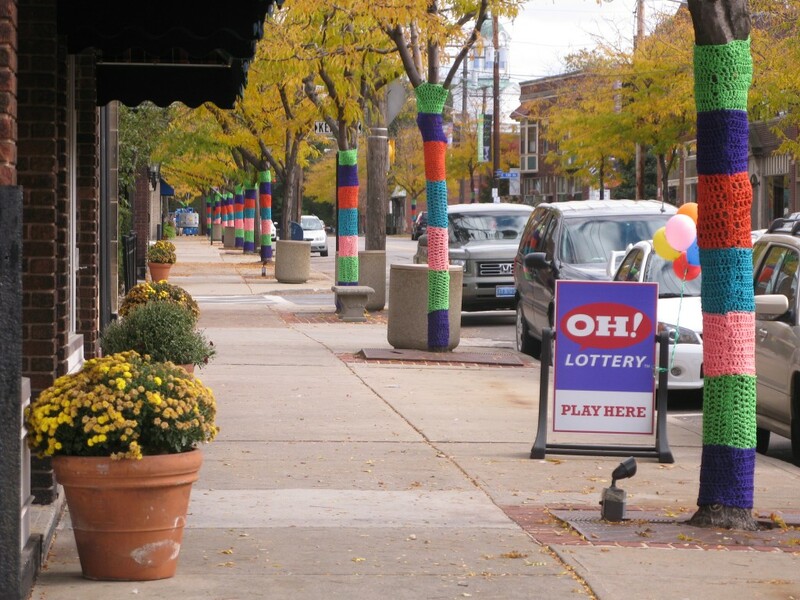 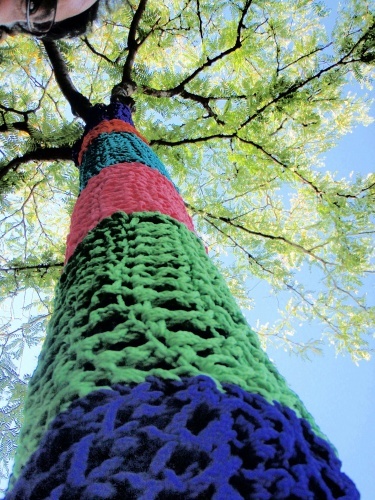 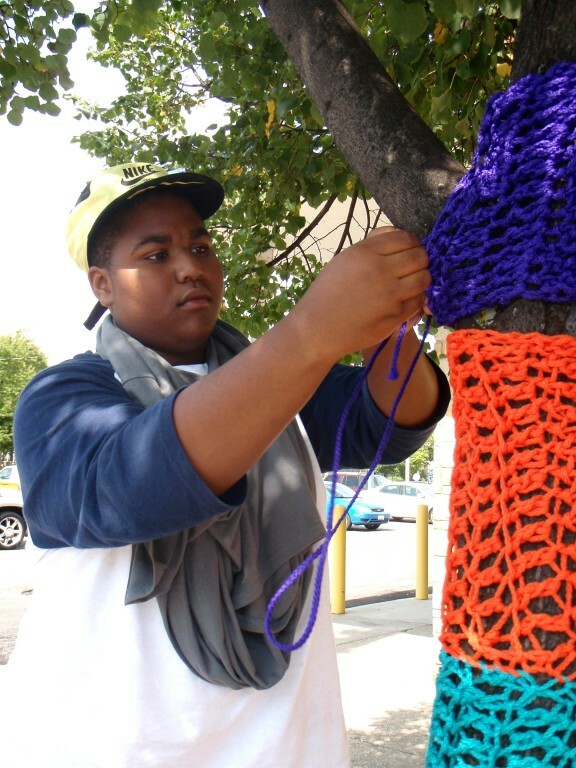 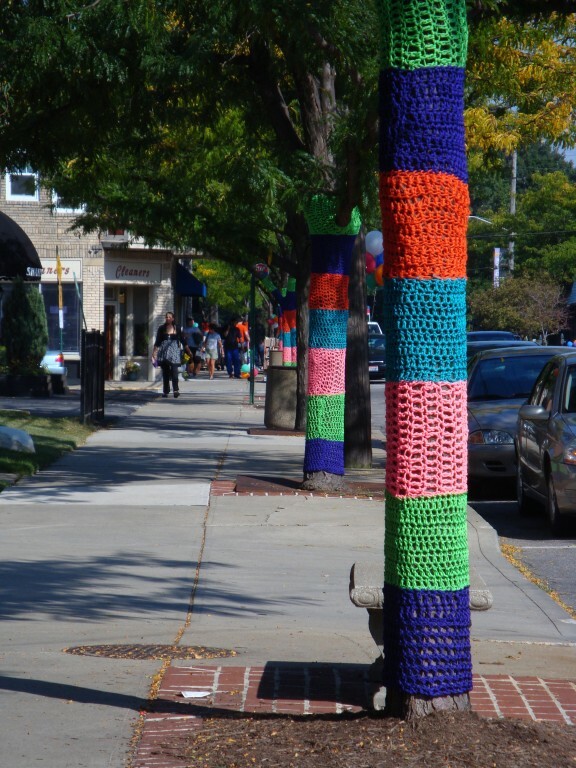 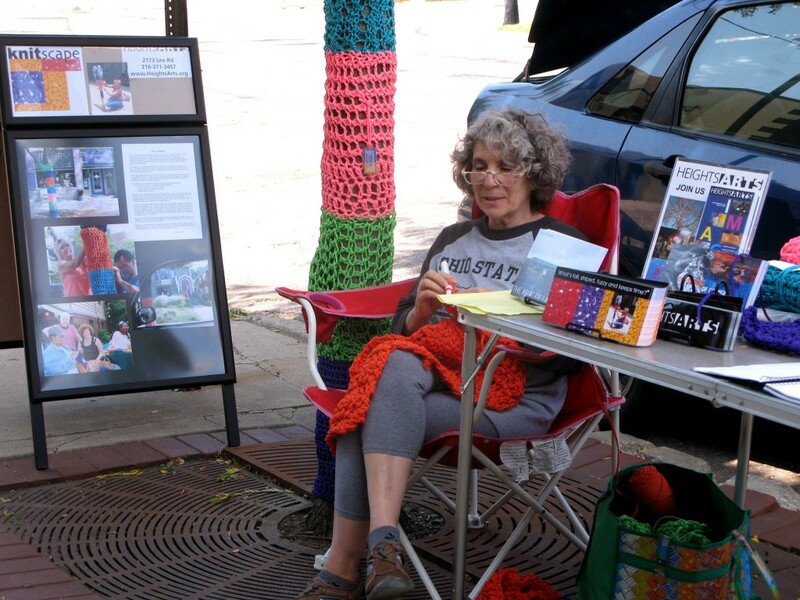 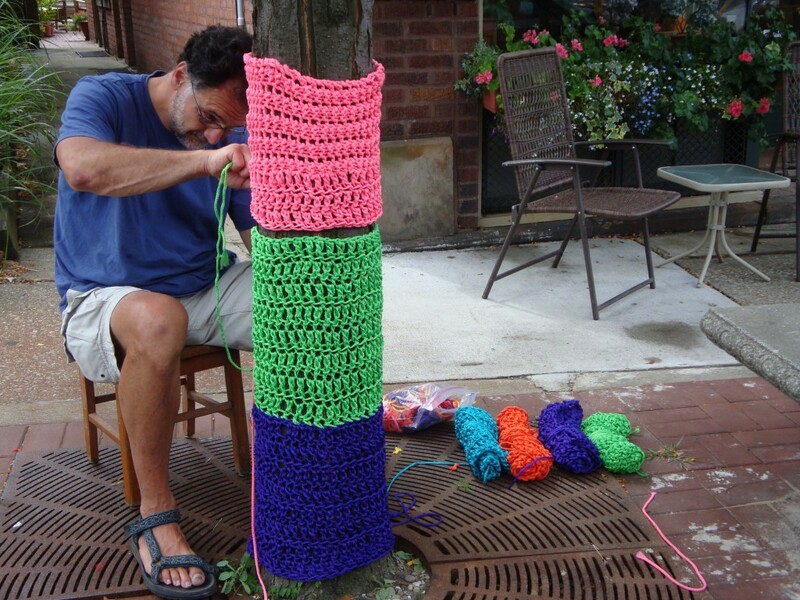 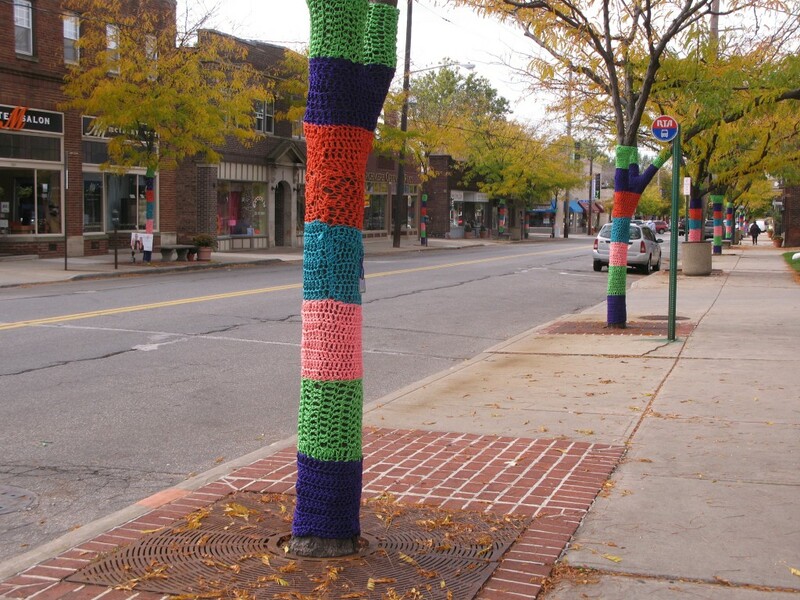 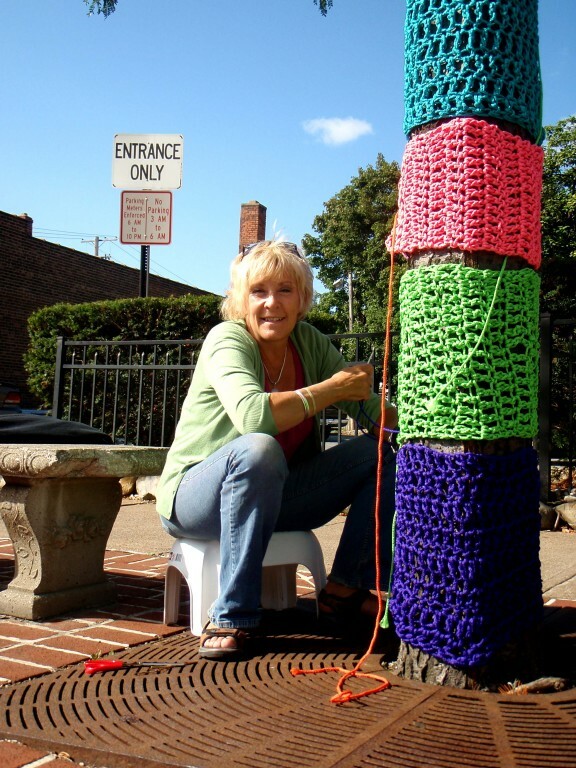 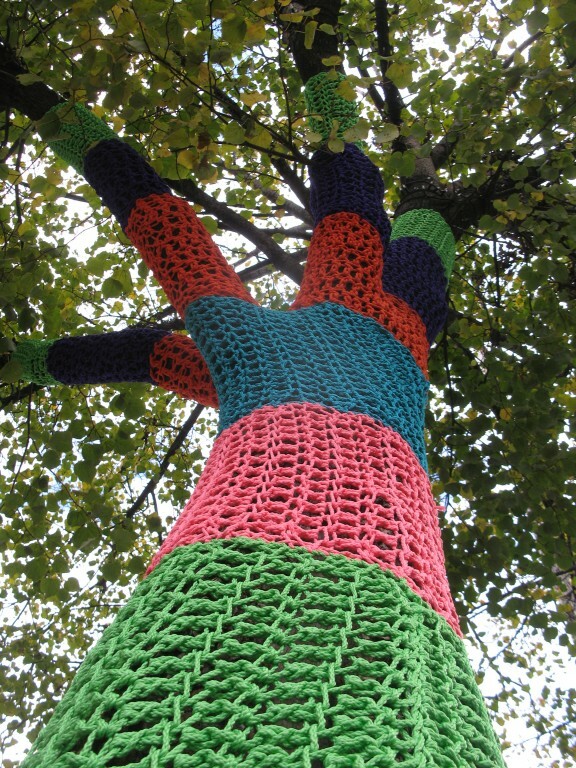 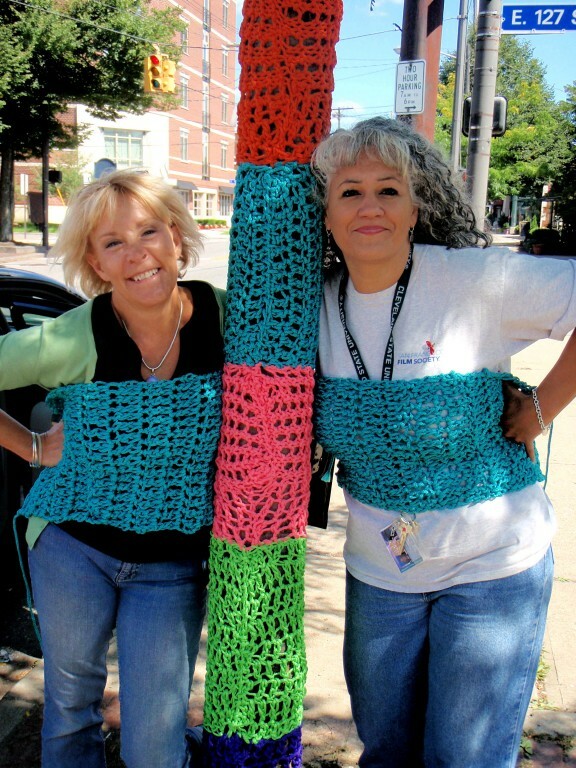 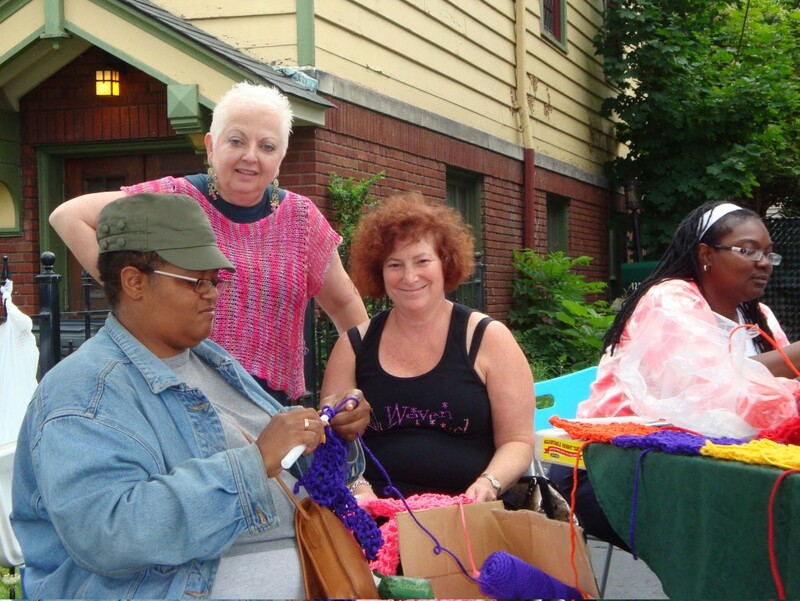 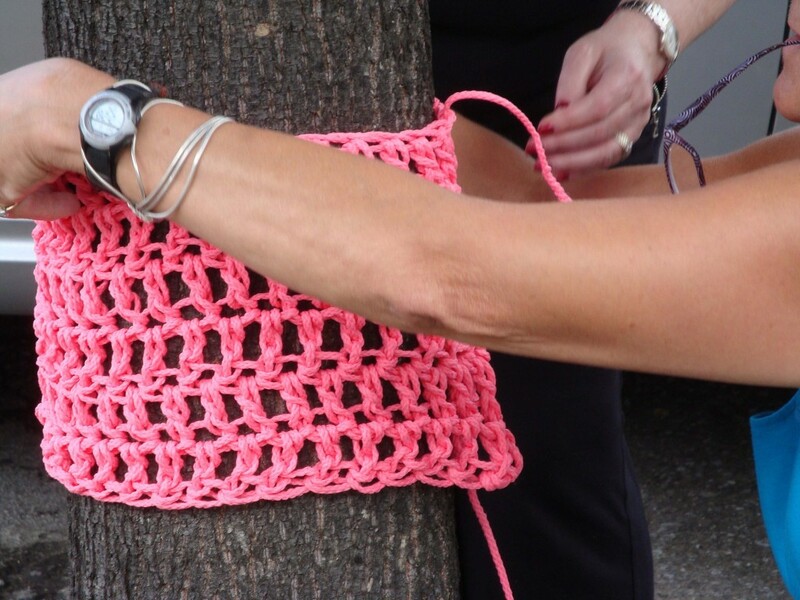 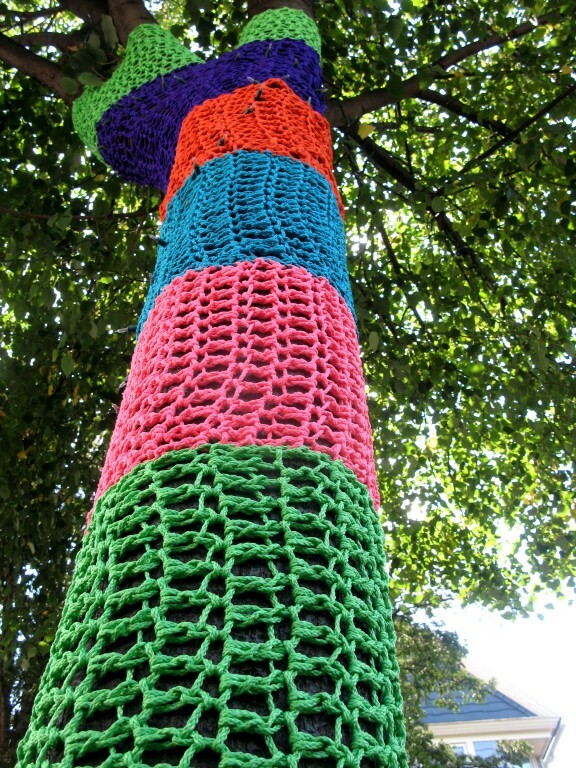 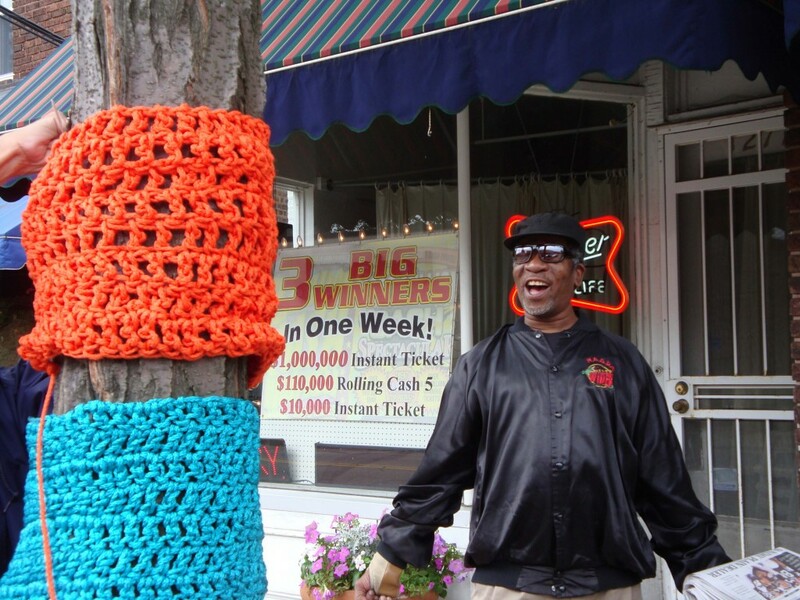 With the help of numerous volunteers, we crocheted cozies for nearly 200 parking meters, 15 light poles, and 5 trees in Cleveland Heights and 44 trees in Larchmere for Knitscape Larchmere. 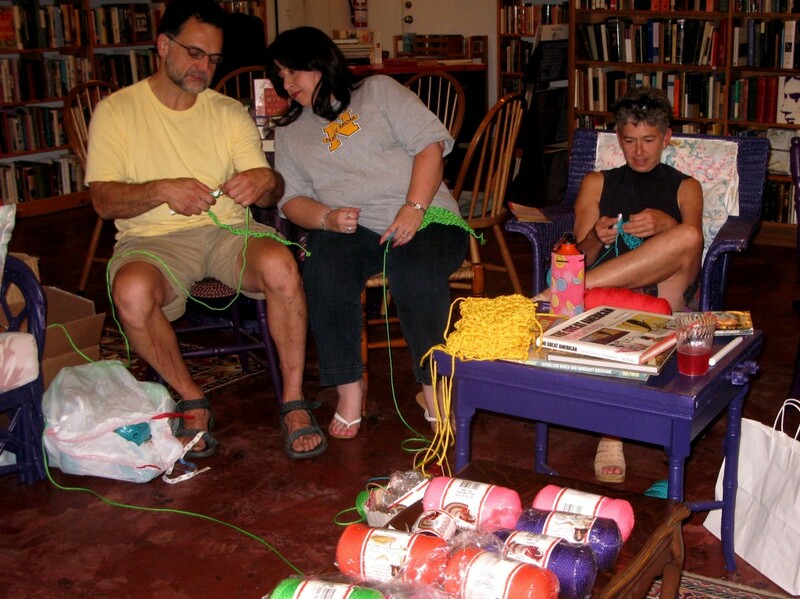 We used approximately 167,000 feet of macrame cord and spent around 1,300 hours on the projects. 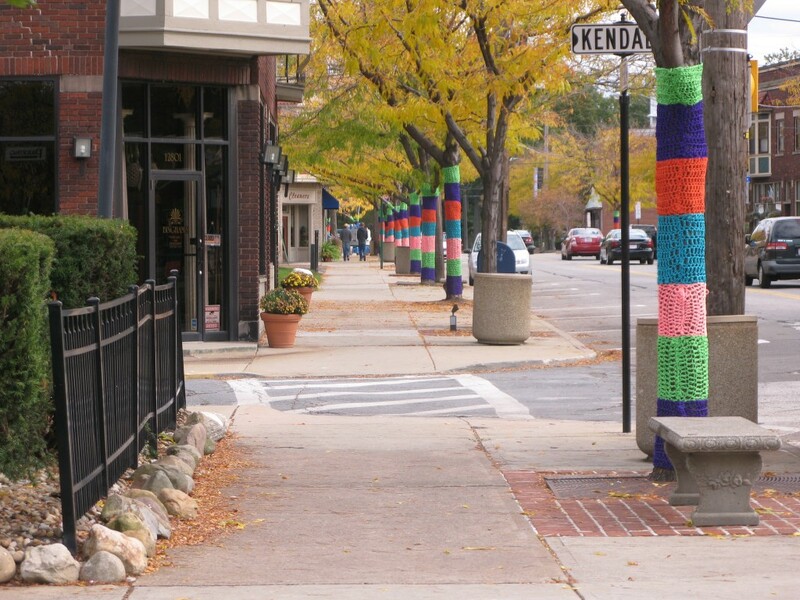 There is no doubt that we energized these areas through art! 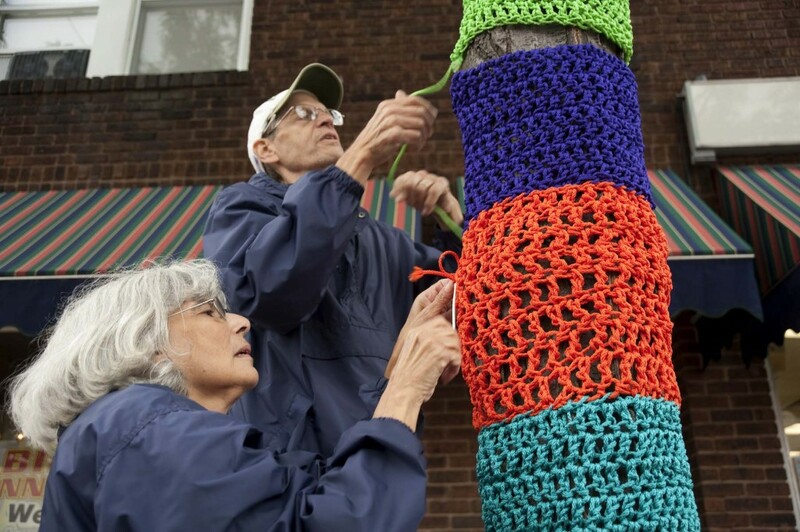 Of more importance to me, however, are the hundreds of connections I and my fellow volunteers formed with the people in these neighborhoods while working in the parking lots and streets for six weeks. 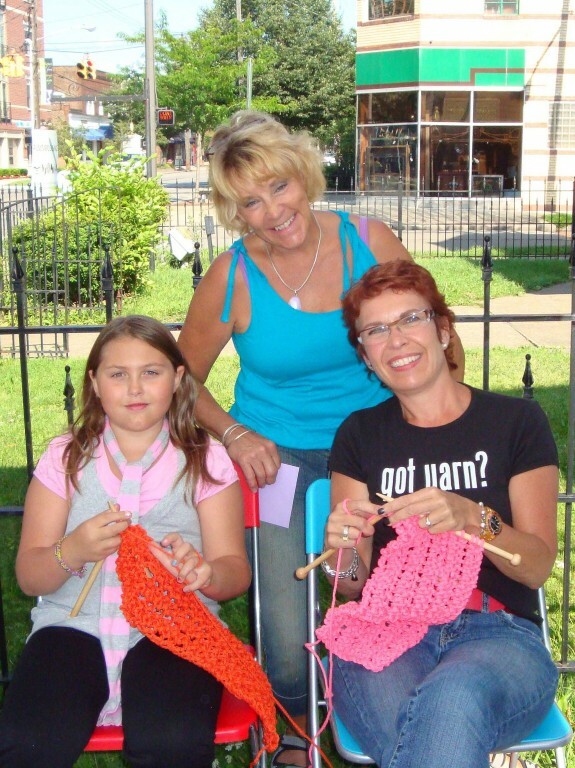 I was the honored recipient of a continuous flow of kindness, curiosity, humor, appreciation and joy from strangers. 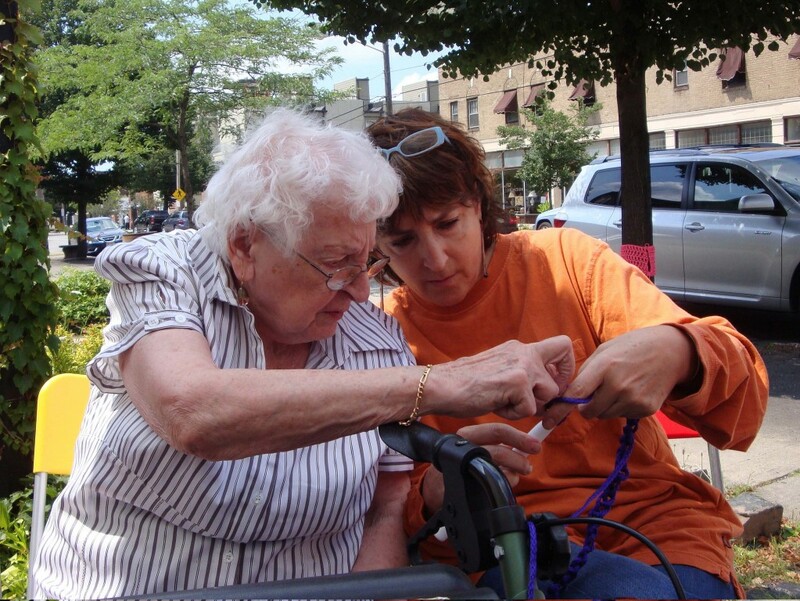 Every day was a delight thanks to community interaction. 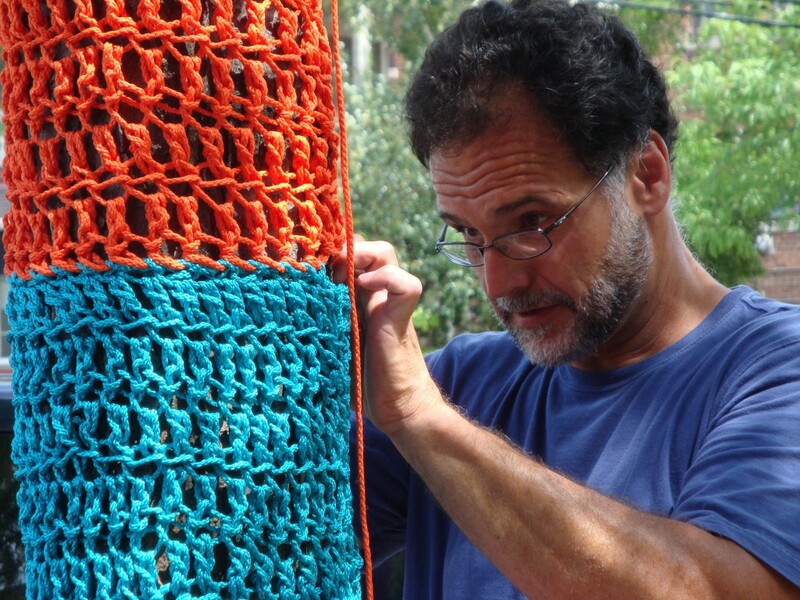 Of course, for me as the artist, the projects also have conceptual underpinnings; it is about comfort vs. confinement. 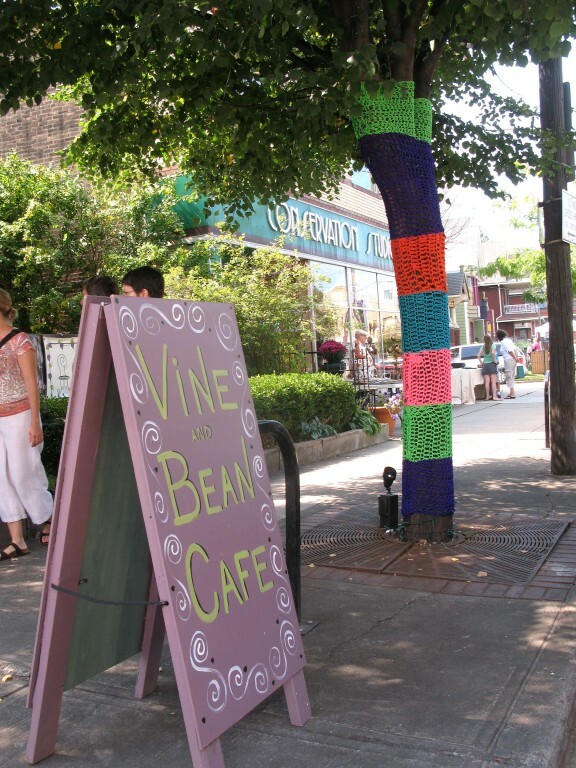 On Lee Road, while it is still true that we are confined by the societal rules and regulations of parking meters, at least in this community we are making that constraint the most comfortable possible. 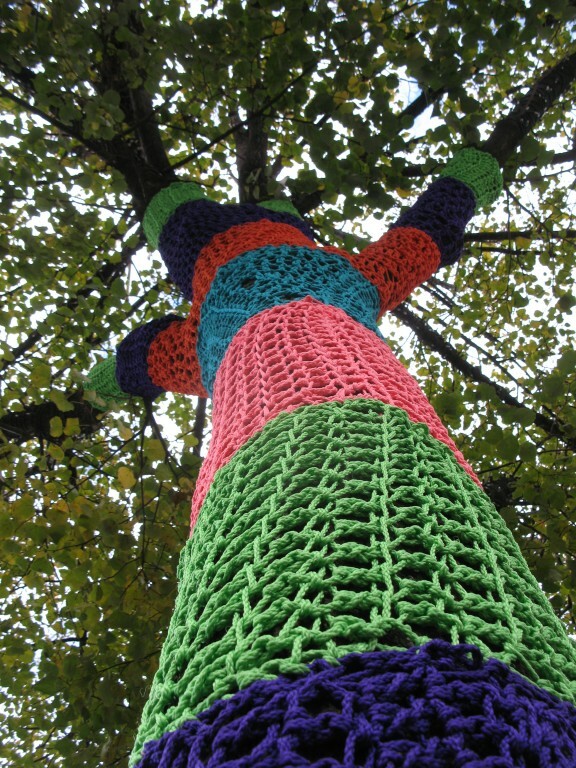 On Larchmere, the trees are cozily confined in their colorful coverings. 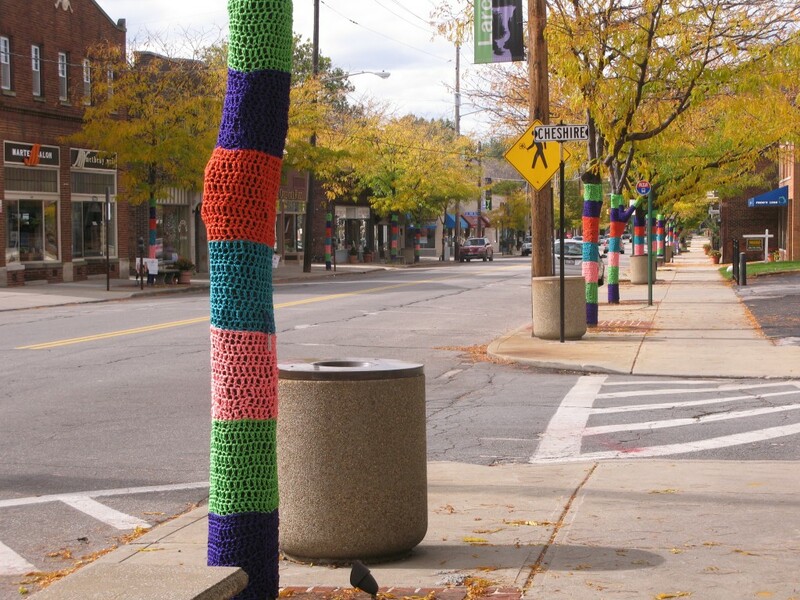 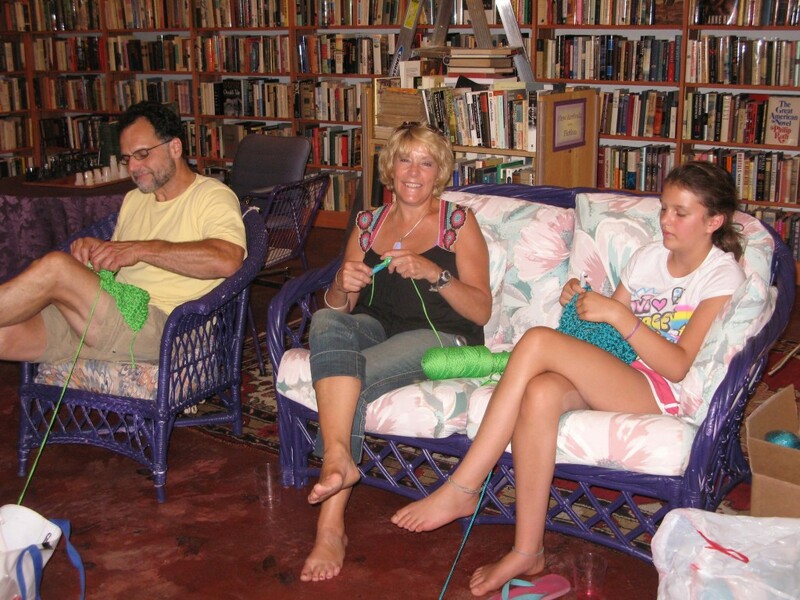 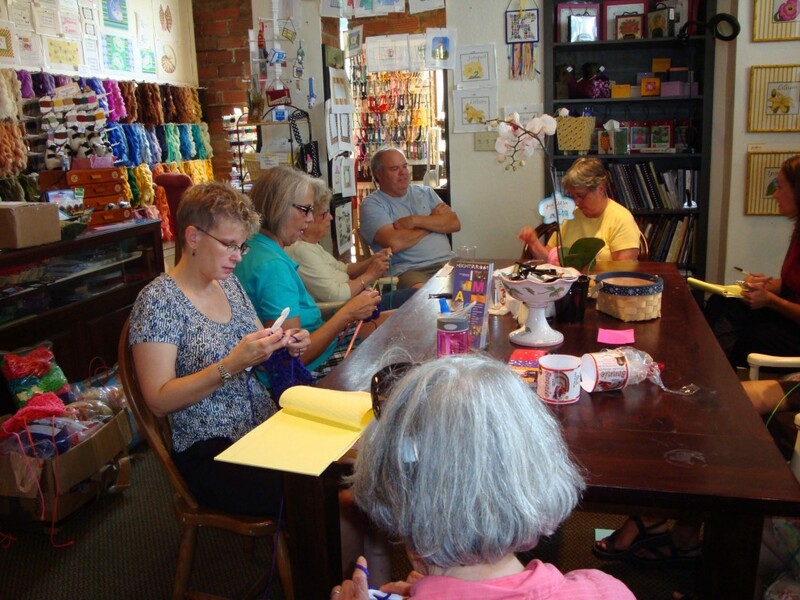 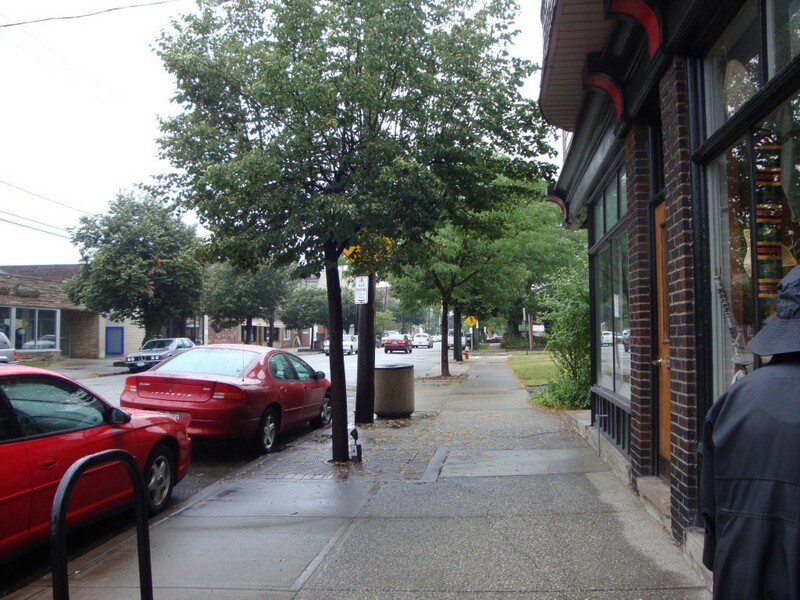 With Knitscapes in place, parking in Cleveland Heights, walking down Lee Road or Larchmere Blvd, or living and working in these communities swung away from confinement and toward comfort...our comfort.